I won a needle-case in a giveaway on Doris's blog. Doris is a bit of a whizz at hand stitching so I thought I'd show it off here. My favourite thing is the rows of little knots. It has also motivated me to sort out my needles. I still have them all over the place, but all the ones I use for quilting are now housed in here, and that makes me feel happy. Small pleasures. I'm still quilting away and now that I've left the idea of tieing this behind me, I am loving how the stitching looks on denim. As I hadn't planned to quilt this, I used what came to hand, which, as it happens, was more Aurifil Lana (earmarked for something else, but what can you do?) I'm using a very dark blue and a lovely light sandy colour, just for a tiny bit of contrast. I'm making good progress, but know that's mostly because I'm still not piecing. When I start again (this week) things will slow right down. Speaking of piecing, next Tuesday is AHIQ link up time, and the launch of our second challenge theme, so do check back here then, or visit Ann to see what everyone's getting up to. I'm linking up with Kathy again for Slow Sunday Stitching. I agree, the quilting is looking gorgeous on the denim! And the mix of threads is perfect. Doesn't it feel good to get it all sorted? Can't wait to see what the next plan on Tuesday will be! I have been thinking about doing a needle case like this and adding labels so I know what kind of needles I have. Love the needle roll on Sue Spargo's site. I never seem to be able to find the type of needle I want. What a beautiful needle case. I like the contrasting thread colors you are quilting with! Your denim circle quilt is lovely, of course. But hand quilting denim? Wow. What needle are your using to push through that and how are your fingers holding up? I can't imagine hand quilting denim! Perhaps you could write a post explaining how you do it; denim is such a tough fabric. Beautiful... love the soft coloured circles you added! What a sweet needle-case! Right now I stick mine through a rectangle of fabric folded into thirds. Lol. I'm pinning your quilt to my pinterest ( hope that's ok) cuz I'm mesmerized by the different sizes of circles and value changes. This is another one of those quilts where the stitching adds so very much. Love this!! This could be an advert For why we hand quilt! I´m happy that my needle-case found such a good home and is usefull. Your circles remember me at mine which are waiting and waiting... You are such a great handquilter Kaja. What a lovely needle case! Are you using the John James size 6 for the denim quilt? I did buy some on your recommendation and I even got them on sale! Love the way the denim quilt it looking! Lucky you - the needle case is lovely! The quilt is looking lovely with the straight line quilting. Looking forward to reading your AHIQ post when it comes through here. I love needle cases/sewing kits. You can put so much personality into them. 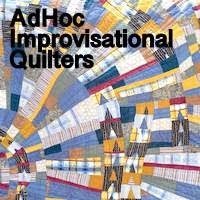 Your hand quilting is gorgeous and I will stop in to AHIQ! What a wonderful prize to win. Your quilting is coming along so nicely; I'm so glad to see that you're loving the new plan for your quilt.